Dan Swinhoe (Asia)- BYOD in Asia: Is It Really A Choice For Employers? Following our look at Bring-Your-Own-Device (BYOD) trends in the Middle East, we now shift our focus to Asia, a region even keener on the concept than their Gulf counterparts. More than three quarters of Asians already regularly engage in the practice, with that figure rising even higher in some countries. Smart devices are gaining popularity across Asia. IDG's own research puts total Asian ownership at around 66%, but are more likely to purchase one in the near future than any other region. At a more local level, China has a massive smartphone market yet a relatively small penetration, Malaysia loves tablets, and Singapore loves both. While Japan lags slightly and India has low numbers, both countries are seeing sales of devices rise quickly. This glut of mobile devices means it's only natural that workers are going to want to bring them into work, and they are, in their thousands. Research from BT shows over 90% of companies in China, India, and Singapore already have some sort of BYOD policy in place or will have in the future. Figures for Malaysia show 82% bring personal mobile devices to work, but 69% indicated their IT departments do not support personal devices and cannot use them effectively in the workplace. For those not yet fully aware, the benefits of BYOD are repeated often, especially by sales people. But in brief the main plus points include greater productivity, higher job satisfaction and lower operating costs, although this is something that is being disputed by some quarters. Efficiency is generally seen as the greatest boon to businesses for justifying BYOD adoption, while workers enjoy the flexibility and freedom. It seems that embracing BYOD is also now a pre-requisite for attracting and keeping the best talent, as today's graduates attach great importance to their devices, and given the choice will always pick the employer that gives them the freedom to choose. On the other side of the coin comes security. 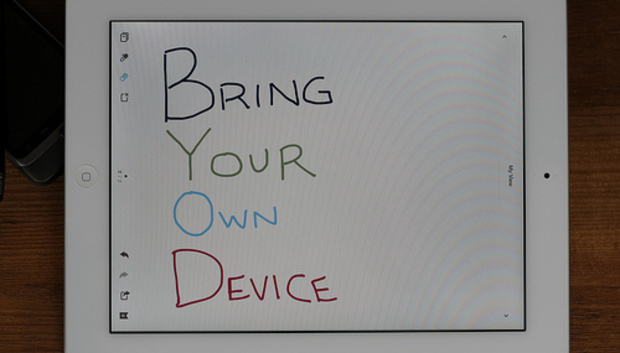 It's easily the biggest challenge associated with BYOD, mostly because there are so many different aspects to it. Problems range from data loss when employees leave phones and laptops in various places on their travels, malware infections (mobile phone security isn't as stringent as desktop) to firms not taking mobile security seriously. Developing your own app store for employees enables you to ensure security, but pushes costs up, something that BYOD is meant to prevent. But while it's true money is saved through no need to buy infrastructure and devices, Aberdeen Group found that a company with 1,000 mobile devices spends an extra $170,000 per year, on average, when they use a BYOD approach. Quite how true that is remains to be seen, but it may end up that BYOD's only appeals comprise of greater efficiency and keeping the staff happy. Not a disaster, but not quite what companies were hoping for. Not strictly related to security but still a possible problem with BYOD is work overkill. Having your workspace in your pocket or constantly within arm's reach creates an ‘Always On' culture that breeds workaholics. While that might sound great for productivity, it creates workers who are tethered to their jobs, which can end up having a negative impact. The need to always answer just one more email or to call that Australian client means staff can be working the equivalent of an extra work day a week putting them under enormous pressure and stress; it can affect their personal lives, and relationships, from lack of sleep and disrupting eating habits to sacrificing family time and events. Stressed, tired and unhappy workers create low quality work. Sometimes the signs can be difficult to spot, but keeping the work environment a happy one is a good place to start. Adopting BYOD- even if you're not sold on the idea- isn't really a choice organizations actually have the power to make anymore. The Generation Y-ers see BYOD as a right , not a privilege, and will be damned if any employers are going to stop them bringing their devices into work. Almost half (47%) admitted they already have or would ignore corporate policy banning the use of personally-owned devices for work-use. And this abuse isn't limited, it afflicts practically every country with a smart device presence. One vice-president of a cloud mobile solution company summed up the situation nicely, "Even if you don't think you're doing BYOD, you're doing BYOD," he said. "It's a matter of whether you're doing it formally or like an ostrich." Over half also believe it's their responsibility, not their employer's, to maintain security on their personal devices while at work. This translates roughly as problems either way; be ignored if BYOD is banned or face possible resistance for trying to impose a security policy when you do allow such devices. While neither may sound particularly appealing, the second option is the safer path. Better to annoy the workers and be safe than have a possible security nightmare later on. BT's research showed less than 20% of Asian companies think their employees recognize all the risks BYOD presents, and even less understand access and permissions related to their devices. Oddly, despite over 70% of Indian companies suffering security breaches due to unauthorized devices, 40% of Indian employees think there is no risk involved with BYOD. In China and Singapore far fewer have suffered breaches and far more think BYOD presents a risk. With over half of IT professionals in India thinking the risks outweigh the benefits, clearly there needs to be education on how to keep safe while using personal devices. There are subtle differences in adoption rates and attitudes to BYOD across Asia, but the overwhelming majority are embracing the trend. It's up to companies to either embrace the trend with them, or try and say no and end up with untold numbers of unauthorized devices using their networks. The real challenge now is to accept BYOD whether you really want to or not, manage the devices, and ensure security is kept high on the agenda.